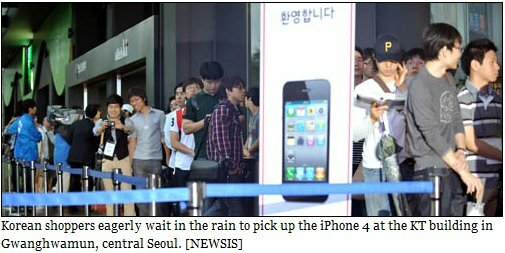 As reported in the Joongang Daily and other papers, the arrival of the iPhone 4 in South Korea was greeted by long lines of customers. (click on the photograph to see a larger version). Although Samsung's Galaxy S and other smartphones are present in the Korean market, they still do not have the sheer number of applications that Apple's platform supports. It seems likely that the iPhone will continue to drive the mobile revolution here, and worldwide, until Android phones catch up on the application side of things. In an encouraging note, KT is taking the iPhone 4 introduction as an opportunity to promote its expanded services for expatriates in Korea. With the growing number of foreigners in the country, KT said it will provide special services for expats in Korea. The mobile carrier opened a twitter account (http://twitter.com/ollehkt_expats) that offers advice in English on the use of the iPhone 4 and KT’s other services. In addition to the permanent expat community in Korea, KT and the other mobile service providers should be explicitly targeting more of the marketing toward tourists and business visitors, who may want to use state-of-the-art mobile services during short stays here! This is great! Finally, a mobile company not acting like foreigners don't exist, or are just a PITA for them!! Maybe SK/LG will follow suit, yet again.